Having already played two escapes over in Margate that day, we were poised to crack this independent company’s room Extinction. Set in a multi-purpose building on a quiet street in Ramsgate, we were welcomed by Real Life Games co-owner and game master Alistair, who after escorting us to the waiting area where we all exchanged some friendly chat, briefed us on the games rules before inviting us to watch a video which detailed the games plot. 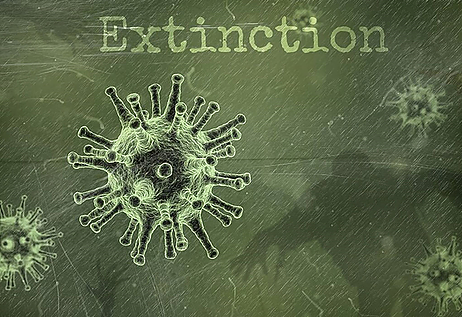 The planet is in the grip of an epidemic that has already killed 1.7 billion people. Lithuanian based Dr Nojus Zareckis has successfully developed an antidote (NV31) but after producing around 100,000 doses of the medicine, Dr Zareckis along with his entire team were slaughtered by rebels who broke in to steal the antivirus. During this vile attack the encrypted research performed to find the cure was also destroyed. 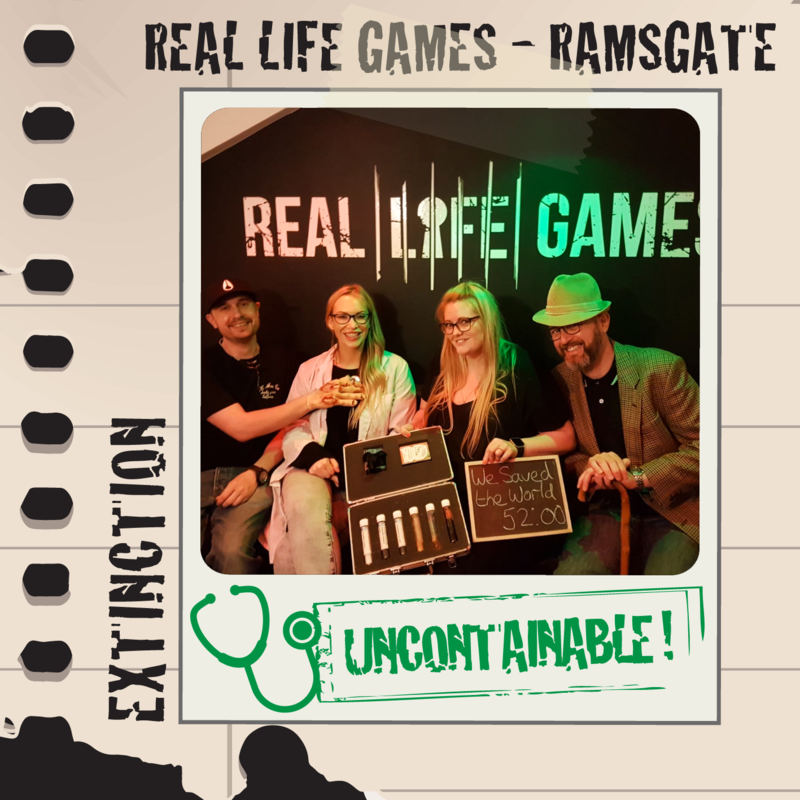 The only hope now is UK (Ramsgate) based Dr Ruoff Nevesorezenin, who was able to acquire a few of the vials containing ingredients before Dr Zareckis' untimely death. Upon entry we were handed a briefcase; the objective was to pack it with a few specified items including the all-important vials so we could make our way to a facility where we could use it without suffering catastrophic consequences. This was a novel idea, rather than the conventional method of solving linear puzzles to reach one overall goal. We enjoyed the task of multiple mini challenges offering their own rewards - which did well to further add to our time pressure and heighten awareness of our progression within the game. On first impressions the room looked to be a relatively generic escape environment, still decorated to a high standard but missing the pizzazz displayed at other venues we’ve encountered recently. However, we were there to play a game, and impressive surroundings do nothing to hide poorly executed puzzles. Thankfully the strength in this room lies in its array of proficient, mind-boggling riddles to solve. We thoroughly enjoyed the rooms ability to let us separate to explore the space, with lots of props to investigate there was plenty to keep all members of our team occupied. As we advanced through the game the puzzles certainly did too, and we were pleasantly surprised to find a few robust technological additions that we’d perhaps not expected upon our earlier scrutiny. Our games master was extremely efficient in pumping through on-screen clues when needed, and we felt he monitored our progress attentively with genuine interest in our game. We escaped in time, having collected all items for the briefcase to cure us from the epidemic. Completing the final puzzle and obtaining the last object only served to intensify our elation of our eventual escape. A rewarding theme that ran positively throughout this game right to its very end. The puzzles here were solid and immense fun to complete. They flowed at a gratifying pace and progression here alongside its unique mid-game rewards made for a fun and fulfilling hour in Ramsgate. Whilst we’d still class Extinction as a traditional escape room, it’s definitely not to its detriment. The detailed plot and superb strength of puzzles here prove that sometimes even the time-honoured originals can survive the genres burgeoning evolution.